Established in 2005, the Cochlear Implant Awareness Foundation® (CIAF) is a 501(c)(3) non-profit organization based in Springfield, Illinois. The mission of CIAF® is to raise awareness of how cochlear implants restore sound to the hearing impaired and to provide cochlear implant equipment to qualified applicants in need. CIAF® was started in 2005 by Michelle Tjelmeland as a way to pay forward the blessings she and her family have received. As the foundation has grown, that Pay it Forward mentality has grown exponentially. District 23 and each CIAF™ fundraising effort has always been staffed with dozens of enthusiastic volunteers. CIAF® continues to be supported by generous individuals and community sponsors who report the joy of giving to the foundation’s efforts has blessed them each in numerous ways. To support CIAF® with a one-time financial gift, please click HERE. Your donations are processed securely through PayPal. CIAF® has over a decade of proven commitment to helping people hear and we will continue this mission long into the future. Your planned gift will help make it possible to not only continue the work we do now, but to expand our reach with fresh initiatives moving forward. 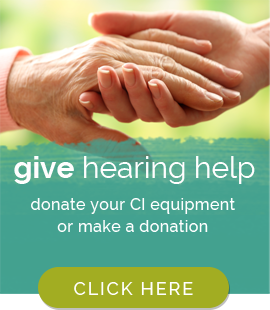 Your legacy can help restore the gift of sound to those isolated by hearing impairment. Planned gifts include: wills/bequests, life insurance, pooled income funds, and charitable remainder trusts. These donations can mean tax savings, income streams, and investment benefits to you and your family. Planned gifts can be made in any amount and are customarily arranged as provisions in the donor’s will with the assistance of an attorney and/or the donor’s financial advisor. Those wishing to make such a gift to CIAF® are strongly encouraged to consult appropriate professionals. I give, devise, and bequeath to the Cochlear Implant Awareness Foundation®, an Illinois charitable corporation, the sum of $______________ (or a description percentage of the specific asset) for the general purposes of helping support the foundation’s efforts to provide information, resources, support, and understanding to current and prospective cochlear implant recipients and their families. 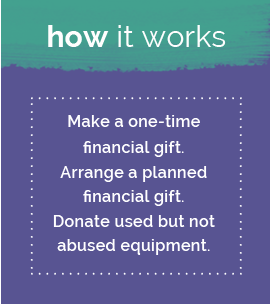 Did you know it’s possible to make a planned gift while you’re still living? You can do so through life insurance and charitable remainder trusts. Discuss the benefits to you and your family with your financial planner. 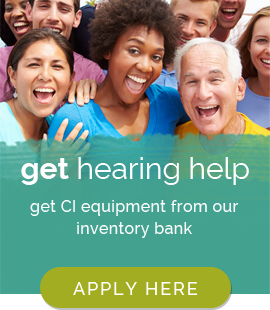 To donate used but not abused cochlear implant equipment like processors, cables, cords, batteries, and accessories to our Hear Again ™ program, including discontinued models, click here! What could be better than shopping AND contributing to a great cause at the same time? We can’t think of anything! District 23 Mercantile & Foundry was established in 2012 as a vehicle to educate people about the work of CIAF®, while financially offsetting operational costs of the foundation. Shop online and learn all about District 23 and the people behind its unprecedented success at www.district23.com. Be the first to see new merchandise and hear about sales and special events! Follow us on Facebook! Don’t miss out on information about special event updates and sales! Text DISTRIC23 TO 70000 for text alerts. Support your charitable organization by starting your shopping now!